Former MI5 (Security Services) officer Harry Tate’s skill at tracking down runaways is second to none –and the Security Services need his help. A group of renegade former soldiers called The Protectory is preying on deserters from the British army, trading their military knowledge for money, a new passport and a whole new way of life. But these deserters aren’t just any group of military personnel worn down by battle, traumatized and sick of fighting; they’re high-value members of elite regiments, with specialized knowledge of Coalition systems, weapons, tactics, communications and planning. And none comes more high-value, Harry is told, than a young woman officer, Lt Vanessa Tan, a former ADC to the British Forces Commander, Afghanistan. Critically, she is said to possess an eidetic (photographic) memory, and foreign governments would pay top dollar for what she carries in her head. The only problem is, nobody knows where she is. But The Protectory is hot on the trail with a buyer in mind, and they will stop at nothing to make sure they get to her first… even if that means killing anyone who gets in their way. At first, Harry is not interested. But then he finds out that one of the driving forces behind The Protectory is George Paulton, his former MI5 boss, who tried to have him eliminated by a killer called The Hit (see ‘Red Station’). I try to use real backdrops for my stories, and this one came about after reading a piece about army deserters, and how they try to find a new life with new documentation; effectively not going ‘off-grid’ so much as finding a new place on it. With the current advances in weapons, IT and communications technology, and the high levels of education and training in today’s military, many army, navy and air force personnel now have hugely saleable skills and knowledge compared with those going AWOL years ago. And any one of these personnel is a potential target for those interested in buying what they know, whether foreign governments, criminal organizations or terrorists. Trying to imagine myself in the position of a deserter, I asked myself what else do they have to trade in return for a new life, ID, money and the chance to disappear for ever, beyond the reach of the authorities? Not much, is the answer. Few runners do so with a firm plan in mind. But having gone as far as it is possible to go in leaving behind their old life, why not sell what they’ve got… what they know? And for some, what they know is of incredibly high-value, whether in the field of technology, weapons, communications or tactics. Of course, like every other field, there are different levels of value… and their saleability is rated according to skills and/or knowledge. And for some (governments), the idea of an officer with a photographic memory, who has been exposed to the most secret information possible, but who wants to start afresh somewhere new, that is a prize worth buying. As always, I wanted to involve Harry Tate in as realistic a way as possible, rather than simply plug him into a situation by chance. Although no longer with MI5 (well, they did try to eliminate him), he is ‘carded’ – authorized to carry a weapon, but on call when needed. This allows him (and me) to go to situations in the field of Intelligence and/or espionage where ordinary mortals simply would not go. 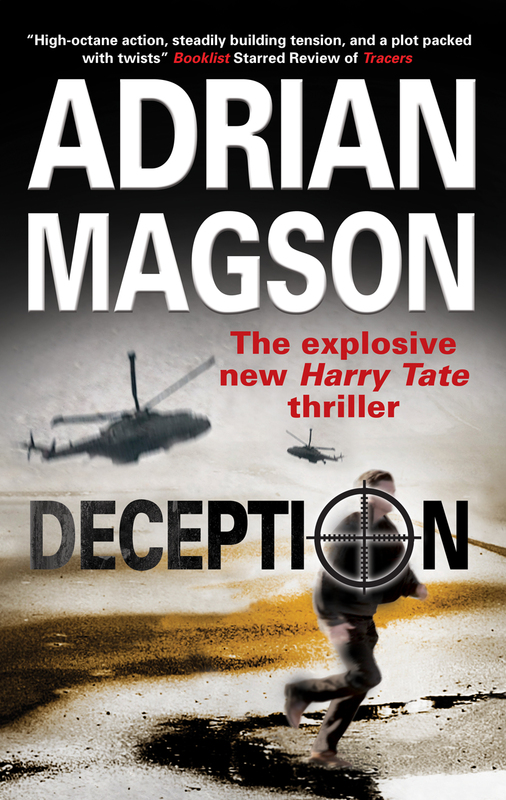 ADRIAN MAGSON is the author of 12 crime/thriller novels and hundreds of short stories and magazine articles. His latest novels are ‘’DECEPTION'(Severn House – Nov 2011), the third in his Harry Tate spy series, and ‘DEATH ON THE RIVE NORD’ (Allison & Busby), in his Inspector Lucas Rocco French police series. A creative writing tutor, he has just released a book for writers – ‘Write On! – The Writer’s Help Book’ (Accent Press – Aug 2011).